On Christmas Eve in the small town of Trafalgar in British Columbia a car goes off the road into a frozen river. Despite the efforts of police and rescue workers the two men in the car, Ewan Williams and Jason Wyatt-Yarmouth who were in town with a group of friends on a skiing holiday, are pronounced dead. When he learns that there is something peculiar about one of the bodies Sergeant John Winters has to delve into events that led to the car ending up in the river. He and constable Molly Smith conduct a series of interviews with Jason’s family and friends and those townsfolk who interacted with them. 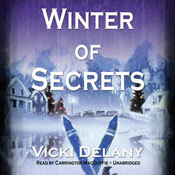 Winter of Secrets shares some of the same features as Valley of the Lost, the second book in this series. We see the same depiction of the intricacies and interconnectedness of small town life and most of the likable characters return. I do like the way John Winters approaches his investigations in a very logical fashion and much of what he digs up comes from ‘old-fashioned’ policing rather than forensic clues. At one point in the story he mentions that the only TV detective he ever liked was Columbo and there are similarities in the way that both approach cases by listening to what people say (and what they don’t say). Delany does a great job depicting the learning curve experienced by a relative newcomer to police work. In this book Molly Smith has just finished her first year as a probationary constable and so she’s still uncertain and makes a few mistakes and this has a very realistic air to it. However I didn’t enjoy this book as much as the previous one and the one big difference was that I didn’t care a jot about the two victims or the annoying friends and family they left behind. It became clear quite early on that the two men who died were spoiled, rich young men who treated the women they knew pretty terribly. The group of friends they had travelled with were the kind of whingeing people I would go out of my way to avoid in real life and Jason’s parents and sister are a textbook dysfunctional family. Of course I don’t believe that anyone ‘deserves’ to die but in fiction I become much more engaged with a story if can identify with the victims in some way or empathise with the loss felt by those left behind and here I didn’t experience either feelings. The book is well-plotted (though I’m not a huge fan of cliffhanger endings) and, once again, I thoroughly enjoyed Carrington MacDuffie’s excellent narration. Delany writes really solid small town police procedurals and this is no exception. In fact her depiction of the grudging dependence that small towns who rely on tourists for employment and income shone through really well here, but, for me, a more sympathetic victim would have rounded off this listening experience more satisfyingly. This entry was posted in Audio Book Challenge 2010, book review, Canada, Vicki Delany. Bookmark the permalink. Bernadette – Excellent review! I know exactly what you mean, too, about vicitms that you don’t care about. As you say, in real life, one doesn’t wish for someone’s death, but in a murder mystery, it helps if the victim’s likable enough that you want to know who killed the person and why. Replied on my blog, but just got to let you know…Bernadette, You are a STAR!!! I don’t mind crime fiction, as long as it is backed up by great research, exotic milieu and intelligent plot. Thank you so much for the sea mail offer, I found all of them in my local library stock and have added them onto my list!! Have a great weekend!